Melt butter over medium-high heat in a nonstick pan. Season chicken with salt and peppers. Add chicken to pan and cook until browned on both sides. Place chicken in a lightly greased 6-quart slow cooker. 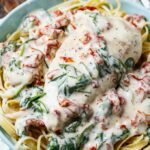 In a medium bowl mix together alfredo sauce, sun-dried tomatoes, Parmesan cheese, Italian seasoning, and red pepper flakes. Pour mixture over chicken. Cover slow cooker and cook on LOW for 3 to 4 hours. Open slow cooker, mix in spinach. Cover and cook 5 more minutes. Serve.